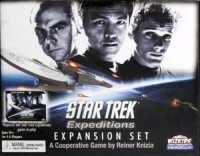 Supplementing Reiner Knizia's acclaimed cooperative board game with characters based on J.J. Abrams' 2009 Star Trek movie, the Star Trek Expeditions: Expansion Set introduces three new crew members – Chief Engineer Montgomery Scott, Lieutenant Hikaru Sulu, and Ensign Pavel Chekov – along with their respective character cards. Each new crew member brings his own unique talents and skills to the game, opening up even more avenues of game play. The Expansion Set also allows you to bring a fifth player to the table, increasing the size of your Away Team by one! Add a Review for "Star Trek Expeditions: Expansion 1"